The free and editable Splatoon wiki. We have 2,059 articles since 24 May 2015 and you can help by editing them! 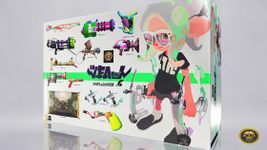 At the fourth Splatoon Koshien Japanese championships, it was announced that Sheldon's Picks will be returning to Splatoon 2, including all weapons that did not get a third variant in the Kensa Collection. They will be released on 3 April 2019 at 01:00 UTC as part of the 4.6.0 version release. Crusty Sean and Murch have teamed up to provide everyone with some gear ability tips via the Squid Research Lab Report on the Nintendo Switch News Channel. If you check out the article via your Nintendo Switch, you’ll receive some Drink Tickets as a courtesy. Keep an eye out for these articles to start popping up late next week! This page was last edited on 15 April 2019, at 16:49. This page has been accessed 4,580,081 times.